This article is about the Anglo-Saxon king of England. For other uses, see Æthelred. Æthelred the Unready, or Æthelred II (Old English: Æþelræd (Old English pronunciation: [æðelræːd])), (c. 968 – 23 April 1016) was King of the English (978–1013 and 1014–1016). He was the son of King Edgar the Peaceful and Queen Ælfthryth and was between ten and thirteen years old when his half-brother Edward the Martyr was murdered on 18 March 978. Although Æthelred was not personally suspected of participation, the murder was committed at Corfe Castle by his attendants, making it more difficult for the new king to rally the nation against the military raids by Danes, especially as the legend of St Edward the Martyr grew. 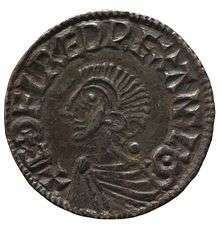 From 991 onwards, Æthelred paid tribute, or Danegeld, to the Danish king. In 1002, Æthelred ordered what became known as the St. Brice's Day massacre of Danish settlers. In 1003, King Sweyn Forkbeard of Denmark invaded England, as a result of which Æthelred fled to Normandy in 1013 and was replaced by Sweyn. He would return as king, however, after Sweyn's death in 1014. "Unready" is a mistranslation of the Old English word unræd (meaning bad-counselled, the ræd being cognate with Rat in German), a twist on his name "Æthelred", meaning noble-counseled. It should not be "unprepared", but rather "ill-advised". The story of Æthelred's notorious nickname, from Old English Æþelræd Unræd (Old English pronunciation: [æðelræːd unræːd]), goes a long way toward explaining how his reputation has declined through history. His first name, composed of the elements æðele (comparable to Dutch edel(e) and adel, as in Old Saxon athal-), meaning "noble", and ræd (comparable to Dutch raad and Old Dutch rat), meaning "counsel" or "advice", is typical of the compound names of those who belonged to the royal House of Wessex, and it characteristically alliterates with the names of his ancestors, like Æthelwulf ("noble-wolf"), Ælfred ("elf-counsel"), Edward ("rich-protection"), and Edgar ("rich-spear"). His nickname Unræd is usually translated into present-day English as "The Unready" (less often, though less confusingly, as "The Redeless"), though, because the present-day meaning of "unready" no longer resembles its ancient counterpart, this translation disguises the meaning of the Old English term. Bosworth-Toller's Anglo-Saxon Dictionary defines the noun unræd in various ways, though it seems always to have been used pejoratively. Generally, it means "evil counsel", "bad plan", "folly". Bosworth-Toller do not record it as describing a person directly; it most often describes decisions and deeds, and once refers to the nature of Satan's deceit (see Fall of Man). The element ræd in unræd is the element in Æthelred's name which means "counsel". Thus Æþelræd Unræd is a pun meaning "Noble counsel, No counsel". The nickname has alternatively been taken adjectivally as "ill-advised", "ill-prepared", "indecisive", thus "Æthelred the ill-advised". The epithet would seem to describe the poor quality of advice which Æthelred received throughout his reign, presumably from those around him, specifically from the royal council, known as the Witan. Though the nickname does not suggest anything particularly respectable about the king himself, its invective is not actually focused on the king but on those around him, who were expected to provide the young king with god ræd (i.e. good counsel). Unfortunately, historians - both medieval and modern - have taken less of an interest in what this epithet suggests about the king's advisers, and have instead focused on the image it creates of a blundering, misfit king. Because the nickname was first recorded in the 1180s, more than 150 years after Æthelred's death, it is doubtful that it carries any implications for how the king was seen by his contemporaries or near contemporaries. In the view of Oxford professor Chris Wickham, Æthelred was one of the most forceful kings of the 10th century, who ended the control of every one of the major magnate families over their ealdormanries in the two decades after 985, and although this was ultimately to prove to his disadvantage, it is significant that he maintained the strength to push all of them into private life in spite of the military crisis of the period. Edward reigned for only three years before he was murdered by members of his brother's household. Though we know little about Edward's short reign, we do know that it was marked by political turmoil. Edgar had made extensive grants of land to monasteries which pursued the new monastic ideals of ecclesiastical reform, but these disrupted aristocratic families' traditional patronage. The end of his firm rule saw a reversal of this policy, with aristocrats recovering their lost properties or seizing new ones. This was opposed by Dunstan, but according to Cyril Hart, "The presence of supporters of church reform on both sides indicates that the conflict between them depended as much on issues of land ownership and local power as on ecclesiastical legitimacy. Adherents of both Edward and Æthelred can be seen appropriating, or recovering, monastic lands." Nevertheless, favour for Edward must have been strong among the monastic communities. When Edward was killed at Æthelred's estate at Corfe Castle in Dorset in March 978, the job of recording the event, as well as reactions to it, fell to monastic writers. Stenton offers a summary of the earliest account of Edward's murder, which comes from a work praising the life of St Oswald: "On the surface his [Edward's] relations with Æthelred his half-brother and Ælfthryth his stepmother were friendly, and he was visiting them informally when he was killed. [Æthelred's] retainers came out to meet him with ostentatious signs of respect, and then, before he had dismounted, surrounded him, seized his hands, and stabbed him. ... So far as can be seen the murder was planned and carried out by Æthelred's household men in order that their young master might become king. There is nothing to support the allegation, which first appears in writing more than a century later, that Queen Ælfthryth had plotted her stepson's death. No one was punished for a part in the crime, and Æthelred, who was crowned a month after the murder, began to reign in an atmosphere of suspicion which destroyed the prestige of the crown. It was never fully restored in his lifetime." Nevertheless, at first, the outlook of the new king's officers and counsellors seems in no way to have been bleak. According to one chronicler, the coronation of Æthelred took place with much rejoicing by the councillors of the English people. Simon Keynes notes that "Byrhtferth of Ramsey states similarly that when Æthelred was consecrated king, by Archbishop Dunstan and Archbishop Oswald, 'there was great joy at his consecration’, and describes the king in this connection as 'a young man in respect of years, elegant in his manners, with an attractive face and handsome appearance'." Æthelred could not have been older than 13 years of age in this year. In 991, Æthelred was around 24 years old. In the aftermath of Maldon, it was decided that the English should grant the tribute to the Danes that they desired, and so a gafol of £10,000 was paid them for their peace. Yet it was presumably the Danish fleet that had beaten Byrhtnoth at Maldon that continued to ravage the English coast from 991 to 993. In 994, the Danish fleet, which had swollen in ranks since 991, turned up the Thames estuary and headed toward London. The battle fought there was inconclusive. It was about this time that Æthelred met with the leaders of the fleet, foremost among them Olaf Tryggvason, and arranged an uneasy accord. A treaty was signed between Æthelred and Olaf that provided for seemingly civilised arrangements between the then-settled Danish companies and the English government, such as regulation settlement disputes and trade. But the treaty also stipulated that the ravaging and slaughter of the previous year would be forgotten, and ended abruptly by stating that £22,000 of gold and silver had been paid to the raiders as the price of peace. In 994, Olaf Tryggvason, already a baptised Christian, was confirmed as Christian in a ceremony at Andover; King Æthelred stood as his sponsor. After receiving gifts, Olaf promised "that he would never come back to England in hostility." Olaf then left England for Norway and never returned, though "other component parts of the Viking force appear to have decided to stay in England, for it is apparent from the treaty that some had chosen to enter into King Æthelred's service as mercenaries, based presumably on the Isle of Wight." On 13 November 1002, Æthelred ordered the massacre of all Danish men in England to take place on 13 November 1002, St Brice's Day. No order of this kind could be carried out in more than a third of England, where the Danes were too strong, but Gunhilde, sister of Sweyn Forkbeard, King of Denmark, was said to have been among the victims. It is likely that a wish to avenge her was a principal motive for Sweyn's invasion of western England the following year. By 1004 Sweyn was in East Anglia, where he sacked Norwich. In this year, a nobleman of East Anglia, Ulfcytel Snillingr met Sweyn in force, and made an impression on the until-then rampant Danish expedition. Though Ulfcytel was eventually defeated, outside of Thetford, he caused the Danes heavy losses and was nearly able to destroy their ships. The Danish army left England for Denmark in 1005, perhaps because of their injuries sustained in East Anglia, perhaps from the very severe famine which afflicted the continent and the British Isles in that year. Sweyn then launched an invasion in 1013 intending to crown himself king of England, during which he proved himself to be a general greater than any other Viking leader of his generation. By the end of 1013 English resistance had collapsed and Sweyn had conquered the country, forcing Æthelred into exile in Normandy. But the situation changed suddenly when Sweyn died on 3 February 1014. The crews of the Danish ships in the Trent that had supported Sweyn immediately swore their allegiance to Sweyn's son Cnut the Great, but leading English noblemen sent a deputation to Æthelred to negotiate his restoration to the throne. He was required to declare his loyalty to them, to bring in reforms regarding everything that they disliked and to forgive all that had been said and done against him in his previous reign. The terms of this agreement are of great constitutional interest in early English History as they are the first recorded pact between a King and his subjects and are also widely regarded as showing that many English noblemen had submitted to Sweyn simply because of their distrust of Æthelred. Æthelred then launched an expedition against Cnut and his allies, the men of the Kingdom of Lindsey. Cnut's army had not completed its preparations and, in April 1014, he decided to withdraw from England without a fight leaving his Lindsey allies to suffer Æthelred's revenge. In August 1015, he returned to find a complex and volatile situation unfolding in England. Æthelred's son, Edmund Ironside, had revolted against his father and established himself in the Danelaw, which was angry at Cnut and Æthelred for the ravaging of Lindsey and was prepared to support Edmund in any uprising against both of them. 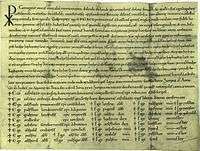 A charter of Æthelred's in 1003 to his follower, Æthelred. Later perspectives of Æthelred have been less than flattering. Numerous legends and anecdotes have sprung up to explain his shortcomings, often elaborating abusively on his character and failures. One such anecdote is given by William of Malmesbury (lived c. 1080–c. 1143), who reports that Æthelred had defecated in the baptismal font as a child, which led St. Dunstan to prophesy that the English monarchy would be overthrown during his reign. This story is, however, a fabrication, and a similar story is told of the Byzantine Emperor Constantine Copronymus, another mediaeval monarch who was unpopular among certain of his subjects. ↑ The use of either the cognomen or the numeral distinguishes him from King Æthelred of Wessex, who ruled from 865 to 871. 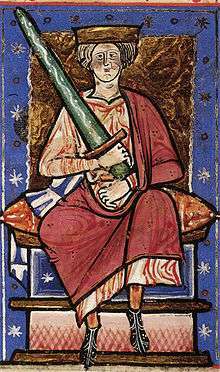 ↑ Different spellings of this king’s name most commonly found in modern texts are "Ethelred" and "Æthelred" (or "Aethelred"), the latter being closer to the original Old English form Æþelræd. ↑ Keynes, "The Declining Reputation of King Æthelred the Unready", pp. 240–1. For this king's forebear of the same name, see Æthelred of Wessex. ↑ Wickham, Chris. "Problems in Doing Comparative History". In Skinner. Challenging the Boundaries of Medieval History. pp. 15, 22, 27. ↑ Stenton, Anglo-Saxon England, p. 374. 1 2 Hart, Cyril (2007). "Edward the Martyr". Oxford Dictionary of National Biography. Oxford: Oxford University Press. Retrieved 9 November 2008. 1 2 Stenton, Anglo-Saxon England, p. 372. ↑ Miller, "Edward the Martyr." ↑ Higham, The Death of Anglo-Saxon England, pp. 7–8; Stafford, Unification and Conquest, p. 58. ↑ Phillips, "St Edward the Martyr." ↑ Keynes, The Diplomas of King Æthelred 'the Unready' 978-1016, p. 166. ↑ Stenton, Anglo-Saxon England, p. 373. 1 2 3 4 5 6 7 8 9 10 Keynes, "Æthelred II (c. 966x8–1016)." ↑ Stenton, Anglo-Saxon England, p. 375. ↑ Stenton, Anglo-Saxon England, pp. 376–77. ↑ Stenton, Anglo-Saxon England, pp. 377–78. ↑ Stenton, Anglo-Saxon England, p. 379. ↑ Stenton, Anglo-Saxon England, p. 380. ↑ Stenton, Anglo-Saxon England, pp. 381–4. ↑ Stenton, Anglo-Saxon England, pp. 384–6. ↑ Stenton, Anglo-Saxon England, pp. 386–393. ↑ The Burial of King Æthelred the Unready at St. Paul's, Simon Keynes, The English and Their Legacy, 900-1200: Essays in Honour of Ann Williams, ed. David Roffe, (Boydell Press, 2012), 129. ↑ Frank Barlow, Edward the Confessor, Yale University Press: London, 1997, p. 28 and family tree in endpaper. ↑ Wormald, "Æthelred the Lawmaker", p. 49. ↑ Liebermann, ed., Die Gesetze der Angelsaschen, pp. 216–70. ↑ Wormald, "Wulfstan (d. 1023)." ↑ Wormald, The Making of English Law, pp. 356–60. ↑ "Ethelred II". Encyclopædia Britannica. 2009. ↑ Keynes, "A Tale of Two Kings", p. 217. 1 2 Turner, "The Origins of the Medieval English Jury", passim. ↑ "III Æthelred" 3.1–3.2, in Liebermann, ed., Die Gesetze, pp. 228–32. ↑ Note that this terms specifies the north and north-eastern territories in England which were at the time largely governed according to Danish custom; no mention is made of the law's application to the hundreds, the southern and English equivalent of the Danish wapentake. ↑ "IV Edgar" 3–6.2, in Liebermann, ed., Die Gesetze, pp. 206–14. ↑ Turner, "The Origins of the Medieval English Jury", pp. 1–2; Wormald, The Making of English Law, pp. 4–26, especially pp. 7–8 and 17–18. ↑ Wormald, "Neighbors, Courts, and Kings", pp. 598–99, et passim. Bosworth, J., & Toller, T. N., eds., An Anglo-Saxon Dictionary (1882–98); with Supplement (1908–21) . Gilbride, M.B. "A Hollow Crown review". Medieval Mysteries.com "Reviews of Outstanding Historical Novels set in the Medieval Period". Retrieved 9 May 2012. Miller,Sean, "Edward the Martyr", in M. Lapidge, J. Blair, S. Keynes, & D. Scragg (eds. ), The Blackwell Encyclopædia of Anglo-Saxon England (1999), p. 163. ISBN 0-631-22492-0. Phillips, G. E., Herbermann, Charles, ed. (1913). "St. Edward the Martyr". Catholic Encyclopedia. New York: Robert Appleton Company. Wikimedia Commons has media related to Æthelred.